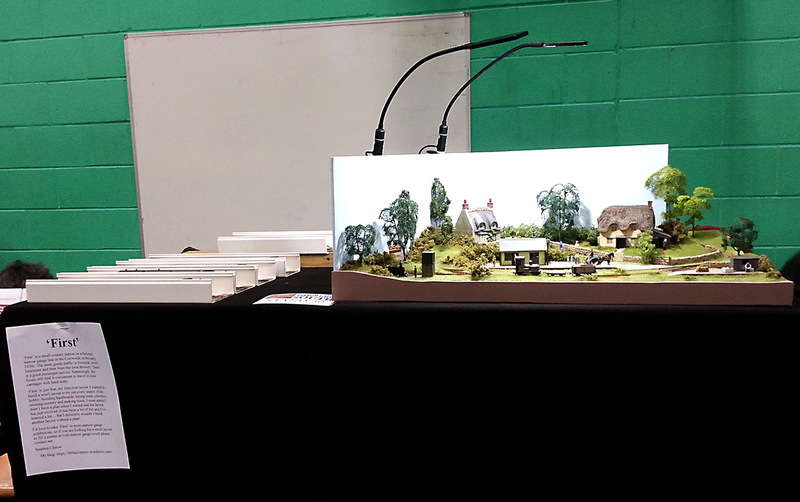 Congratulations to the Wessex Narrow Gauge Modellers for organising Narrow Gauge South, it was excellent. The organisers took two big decisions. Firstly, to move to a new venue and secondly to create a bigger exhibition with 34 layouts and 26 traders and societies. For me, both decisions paid off handsomely. The exhibition was top quality and the venue was super. I was exhibiting ‘First’ and I had a very enjoyable day playing trains and talking to everyone. Many people introduced themselves: visitors who liked the layout, people who read this blog and members of the NGRM forum. Thanks, for saying ‘Hello’. It was a pleasure to meet you and talk with you all. I tried a new way of presenting the layout. I put it on top of the transport box to raise the viewing height. I think this made the layout easier to see and people could view the stock in the cassettes at the same time. Plus, I didn’t have to bend down to operate and I left the exhibition without an aching back! The organisation of the exhibition was excellent. The organising team were friendly, helpful and very efficient. Special thanks to the four guys who carried everything from the car into the exhibition hall for us, Will for operating the layout to allow me to get lunch and to Tim Couling for his excellent communication from beginning to end. I can’t wait for the next Narrow Gauge South in 2020.